What do actors Ryan Reynolds and Dwayne (The Rock) Johnson, NFL wide receiver Brandon Marshall, Cleveland Cavaliers’ Kevin Love, Princes William and Harry, musician Logic, Olympian Michael Phelps, and comedian Wayne Brady have in common? They are champions of increasing awareness of mental health issues and decreasing mental health stigma specific to men. Each has used their prominent voice to share their mental health challenges and recovery. You may read about their individual efforts here. It inspires hope that as more male figures speak out about their experiences, other men will relate, feel less alone, and be more inclined to speak up and get support! 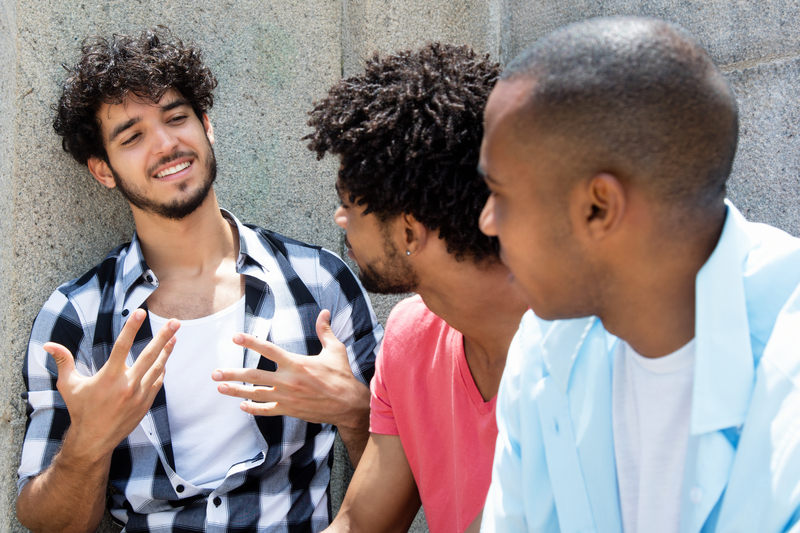 Here, we share additional well-designed, innovative programs seeking to create healthy, enabling environments for men to acknowledge, discuss, and seek support for their emotions and mental health challenges. NFL All-Pro wide receiver, Brandon Marshall, has been a leader in making mental health advocacy a part of his platform. In partnership with Bring Change 2 Mind, whose mission is “to end stigma and discrimination related to mental illness,” Marshall launched the #StrongerthanStigma PSA campaign. This campaign features a collection of video stores highlighting courageous men sharing their stories. Key themes among the videos include emphasizing that mental health challenges among men are common, discussing the many reasons men do not seek out help, sharing the benefits of speaking out, and underscoring the bravery and guts it takes to begin conversations about mental health challenges. Check out the videos here. To hear more about how masculinity norms impact men’s mental health and one man’s efforts to redefine what it means to be masculine and strong, you might listen to the following podcast episode, entitled “Manhood and Depression” which can be found here. Heads Up Guys is only one of many projects funded by the Movember Foundation, the only charity focusing on men’s mental health and suicide prevention on a global scale. Their mission is to “help men lead longer, happier, healthier lives.” If you are familiar with the “mustache” movement – an annual event in November where men grow mustaches to raise awareness of men’s health issues – then you know of one Movember movement. The Movember movement specifically funds programs designed to reduce the number of preventable deaths, including deaths by suicide. Founded in Australia and New Zealand, the Movember Foundation has now been launched internationally; it has even received the distinction of being named one of the world’s top non-governmental organizations. To access information about all of their internationally funded projects related to mental health and suicide prevention, go here. While there are dozens of interventions, some of the most novel involve sports-based interventions, meeting men where they are at (such as in bars, bathrooms, and sporting events), programs for particularly hard to reach populations (newly retired, indigenous communities, gay men, men of color, veterans), online and app-based interventions, and father-son programs. Middle-aged men are particularly vulnerable to mental health challenges, substance abuse and suicide. Indeed, over ¾ of national suicide deaths are males (https://rogersbh.org/about-us/newsroom/blog/why-telling-men-simply-talk-about-it-simply-isnt-enough), with middle-aged men being the highest risk group for suicide. In 2012, a 24/7 online service integrating the power of technology and humor was launched to reach this group of men, provide a space where “men come to be men, offer “therapy the way a man would do it,” and teach men about stress, anger, depression, addiction, and suicide. This online service has since partnered with numerous state local health departments (including in Wisconsin), grown internationally, and catalyzed thousands of men -who wouldn’t ordinarily do so- to access mental health services. Man therapy is essentially a resource for men who have never before addressed mental health challenges. It introduces the audience to a fictional doctor – Dr. Rich Mahogany- who is a caricature of masculinity stereotypes and uses a humorous approach to run a virtual office. Here, Dr. Mahogany shares video testimonials of men living with mental health challenges, offers an 18-point “head inspection” (e.g., mental health assessment), provides a mental health report card along with strategies for addressing common mental health challenges, and gives referrals and links to local therapists, support groups, and suicide crisis lines. Beginning in August, WISE will consider a possible future initiative to explore the stigma men face when it comes to mental health and suicide. Please email WISE @WiseWisconsin.org if you would like to attend our planning meeting where we will bring together those interested in this topic, share current research and information about local programs, and brainstorm possible next steps. This meeting will take place in Oconomowoc from 9-11:30 on August 21. Location details will be provided upon registration. The podcast highlighted in this blog was produced by Giving Voice to Depression.